Every Friday we spotlight low-carb recipes you might want to try and this week I am spotlighting my favorite low-carb recipes for baked chicken, which I think is perfect for dinner in the winter! Use the Recipes-by-Diet-Type Index to find more recipes like these. Click here to PIN this collection of great low-carb chicken recipes. 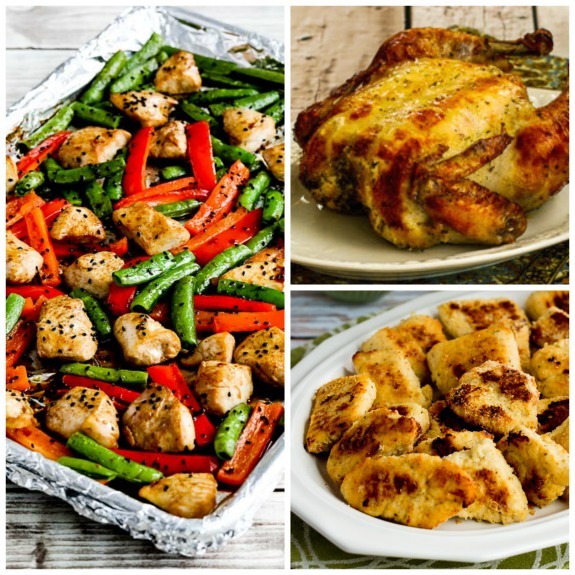 When it's cold outside, dinner made in the oven seems extra good and most people usually have some chicken in the freezer, right" So for this week's edition of Low-Carb Recipe Love I thought I would share my favorite low-carb recipes for chicken that's cooked in the oven. And as usual I had a hard time narrowing it down, but after checking all the options I've picked The BEST Low-Carb Baked Chicken Recipes from Kalyn's Kitchen. I'm actually traveling this week, and I'm hanging out with my friend Lydia. I wrote this post before I left home, and by the magic of post scheduling it's coming to you, hopefully giving you some inspiration for cooking over the weekend. All these are favorite recipes I'd make for guests; hope some of them might be your favorite ideas for baked chicken too!